You can bet that anyone you meet will at least have heard about this famous equation. You have probably come across it for a hundred times yourself. But what does E equals mc squared actually mean? What is the mysterious mass energy equivalence principle? What had Einstein to do with it? Continue reading to find out! In 1905, Albert Einstein proposed a theory which stated that mass and energy are equivalent. It meant that the law of conservation of energy (it says that the sum of potential energy and kinetic energy of a body is constant) and the law of conservation of mass are in fact the same. Also, Einstein stated that even a particle in rest has some energy, called its rest energy. But what exactly do the letters in this famous equation stand for? m is simply the mass of an object. c is the speed of light - a constant value of 299 792 458 m/s. E is the rest energy of the object. Once you start to think about it, the consequences of the formulation of E=mc^2 equation were astounding. Einstein proposed a world in which mass is just energy waiting to be 'set free'. And not just some energy - an enormous amount of it. The average adult weight is 62 kg. Such a person, according to Einstein, has a rest energy of 5.6 * 10^18 joules. (You can check it with our E mc2 calculator.) Just for comparison, the bomb dropped on Nagasaki had the energy of 84 TJ. In essence, if you managed to explode and set all of your rest energy free (which is not achievable... yet), you would cause the same destruction as over 66 000 nuclear bombs. Saying it's a lot is definitely an understatement. This formula was a lifesaver for everyone trying to understand how the universe works. It explained why radioactive materials don't 'melt' while emitting streams of particles (it is because of the extreme efficiency of conversion of mass to energy). It also explained why the stars don't run out of hydrogen, their main fuel, for billions of years. Suddenly, the age of universe appeared much more credible. 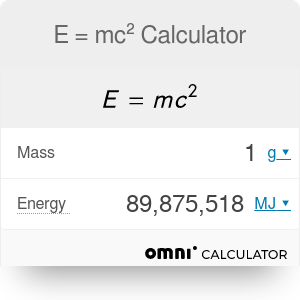 E = mc2 Calculator can be embedded on your website to enrich the content you wrote and make it easier for your visitors to understand your message.